In this part, we will look at the new Figma figures slated for release in the near future. Kotobukiya Yoko 1/6 Scale revealed! This Kotobukiya 1/6 scale figure sample of Yoko from hit Gainax series Gurren Lagann went on display at the Kotobukiya shop in the Akihabara Radio Kaikan today. 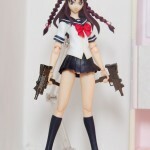 She will be released with Boota the mole mascot, her trademark sniper rail gun with working parts like a movable stand and reloading systems. Her ornate skull hair accessories are removable and she will come with an alternate winking face (and winking skull hair piece). The only details revealed so far is that she’ll be released sometime during summer and that pre-orders will begin in February. Please click the title bar for more images. From Macross Frontier, MegaHouse and HobbyJapan have joined forces to bring us this figure of Ranka Lee in a bikini, based on a nose-art rendition of her from the show. 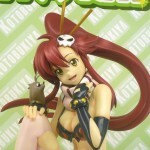 Although nothing is stated, from the released pictures, it appears that the bikini top might be a cast off component. Unusual given that it is Macross. The colours are not finalised, so Ranka fans can be at ease to know she might yet appear with her trademark green hair. 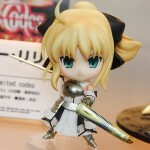 The PVC figure is due for release in May priced at ¥6,000. To view additional images, click the Title Bar.